Making Tuesdays just a little better one shot of tequila at a time. The TEQUILA TUESDAY MARTINI INGREDIENTS 1-1/2 Oz Tequila 1 Oz Triple Sec 1 Oz Fresh Lime Juice 1 Oz Fresh Tangerine Juice 1/4 Oz Agave Syrup 1/4 Oz Grenadine Garnish: Maraschino Cherry Tools: Cocktail Shaker, Hawthorn Strainer DIRECTIONS Chill your glass in the freezer. Fill cocktail Shaker with ice then add the tequila, Triple Sec, lime and tangerine juices and agave syrup, shake until chilled, strain into the glass. Gently pour the Grenadine down the side of the glass so it settles on the bottom Garnish and serve. 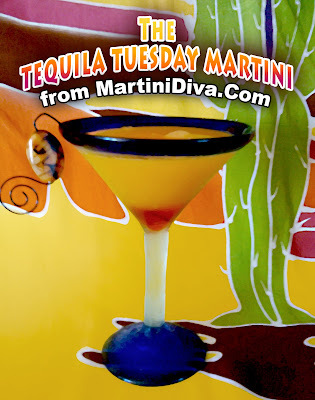 Purchase the Tequila Tuesday Martini Recipe Card Here Oh, tequila, savage water of sorcery, what confusion & mischief your sly, rebellious drops do generate ~ Tom Robbins Happy Tequila Tuesday!